Layer Cake with different sensation of taste in every layer is a unique culinary delight. It surprises us! The crunchy layers with the smooth butter in a special orange taste will spoil any culinary lovers. Add the flour and salt in a mixer and mix them with a hook. Keep stirring them until they are transform into a dough that is smooth and not sticky on the bowl. Ball the dough and mark the dough with "+" (do not let the dough be cut). Then, set aside it for 10 minutes in a chiller. Take the dough from the chiller and roll the dough like an open envelope. Add pastry fat shortening in the middle and fold the edges covering the pastry fat. Roll the dough in 5-7 mm in size, fold it with single fold and mark on the side of the dough and put it on the chiller in 10 minutes. Take the dough and rotate it until you find the mark. The mark should be placed on the top. Roll the dough again in 5-7 mm in size, fold it with single fold and mark on the side of the dough and put it on the chiller in 10 minutes. Do the same step until 6 times single folds. Heat the oven with above side heater temperature at 210°C. Put the metal pan that is rotated in the oven (to avoid direct contact between the metal pan and below side heater). Whisk the egg yolk and icing sugar until they expand. In another mixer, whisk margarine until it expands and then, add condensed milk and mix them well. Add the whisked margarine into the whisked egg. Mix them well. Next, add the flour that has been sieved and mix them well. Heat a 22x22x4 cm metal pan that has been covered by baking pepper on the lower side. Then, put 3 tbsp of the whisk ingredients in the metal pan and arrange them well in the lower side. Bake it in 5 minutes. And put 3 tbsp the whisked ingredients again on the top side of the first baked whisked ingredients. Make the orange syrup with cooking the orange juice with sugar and orange zest well. Then, add orange pasta and set it aside. Whisk white shortening and margarine until it expands well. Next, pour orange syrup and condensed milk and blend them well. Take 1 puff pastry. 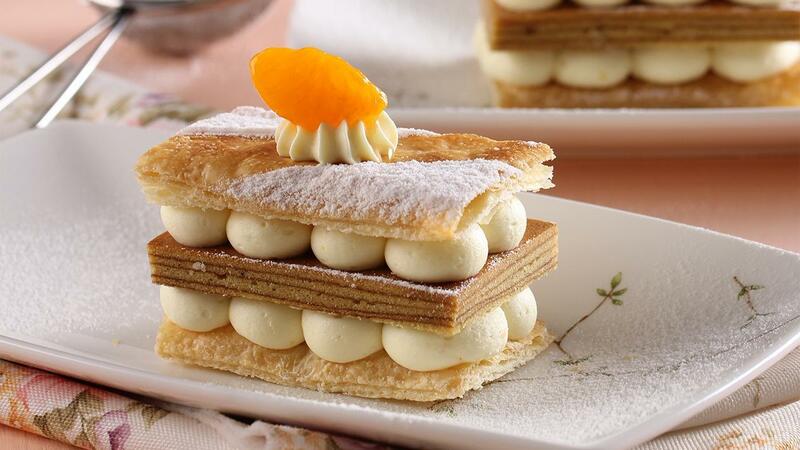 Pipe orange butter cream on the top of puff pastry and put the sliced layer cake on the top. Pipe orange butter cream on the top of the layer cake and put another puff pastry on the top. Garnish it with dusting sugar, orange butter cream and canned Mandarin orange.